DES MOINES — Andrew “Andy” Lara, 55, of Des Moines, formerly of Fort Dodge, died February 10, 2018, of natural causes at his home. Funeral services will be held 11:00 a.m. Wednesday, February 14, 2018, at Riverside United Methodist Church. Interment will be held in North Lawn Cemetery. Visitation will be held from 4-7 p.m. with a prayer service and time for sharing at 6 p.m. Tuesday, February 13 at Gunderson Funeral Home and Cremation Services. 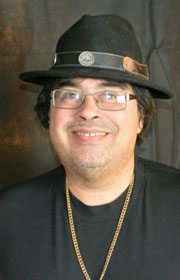 Andrew Gomez Lara, son of Gomez and Joan (Delle) Lara, was born January 29, 1963, in Fort Dodge, Iowa. He graduated from Fort Dodge Senior High in 1981 and attended DMACC in Des Moines. He taught as a professor at DMACC for 10 years and worked in computer technology, most recently at Berkley Technologies. Andy was married to Sheila Romero and the couple later divorced. He was a member of Riverside United Methodist Church, where he was baptized and confirmed. Andy had great faith in Jesus and loved attending church services. He enjoyed sports, riding his Harley motorcycle, and photography. Time spent with family and planning family gatherings was most important to him. He is survived by his children Andrea (Joe) Rink, Vanessa Abreu, all of Des Moines, Teresa (Jon) Leonetti of Urbandale, and Alicia Abreu of Salt Lake City, UT; his grandchildren Joseph and Gianna Leonetti; his mother Joan Lara of Fort Dodge; his brother Michael (Theresa) Lara of West Des Moines and his Goddaughters, Elizabeth, Danielle and Samantha. He was preceded in death by his father Gomez Lara, his brother Danny Lara, paternal grandparents Timo and Lupe Lara and maternal grandparents Raymond and Evelyn Delle.